Sydney's Fashion Diary: t+j Designs Style Challenge! Statement jewelry is something that I haven't ventured into. As a petite women, I try to avoid bulky jewelry. Regardless of which type of statement jewelry that you choose, there is only one rule – wear one statement piece at a time. You do not want to over accessorize with jewelry. 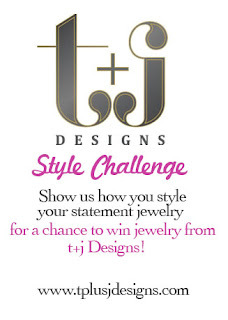 t+j Designs is currently hosting a statement jewelry styling challenge, I thought it would be fun to enter. For this challenge, I am wearing the Flo necklace c/o Poshlocket. As you can see, this necklace is very dramatic. I wanted this necklace to be the center of the attention so I kept everything else minimal. I chose this simple black and white dress as a backdrop to show off this beautiful necklace. This necklace is the perfect statement piece for the holidays and currently on sale. Poshlocket offers free shipping and returns on all orders. Don't forget to enter code "HOLIDAY20" at check out for an additional 20% off (sale items included). Originally, I had on a bodycon dress and my hair was up in a high bun. Looking through the photos, I realized that look wasn't me. I decided to put together a brand-new look that you're seeing in this post. Here is a snapshot of the original outfit, to show you a better view of the necklace. I am much more comfortable wearing the second outfit than the first one. I do love blogging and enjoy reading style blogs. However, I always stay true to what suits me and my style. I love statement jewelry. I'm also trying to venture into that arena. oh wow, i love the gold necklace with the turquoise dress. i'd love to see the whole outfit and the necklace. it looks stunning on you! I like how you styled it since it's very classy. Statement necklaces are something I'm trying recently too. My next post is actually going to feature one so come check out my blog! Absolutely beautiful, Sydney! I hadn't realized you're wearing the same necklace in both outfits until I looked closer. I'm guilty of stacking statement necklaces, and rings, and bracelets. Alright, all kinds of jewelry really :) Need to learn some restraint! I love how delicate that necklace looks - it's beautiful. It has an almost blue-ish tint to it in the photos of your first outfit, but seems a bright gold in the second; I like how versatile it is. Wow I didn't realize that was the same necklace! I really like it with the turquoise dress. I think that maybe the pattern of the first dress is busier so you don't notice the statement necklace as much. Great entry! I love, love how you styled that necklace! Totally makes the entire outfit fabulous. Such a pretty necklace and looks so nice with the black and white. I thought it was silver until I saw it against the turquoise in your last pic. I'm very intrigued by your other outfit - would you be willing to post that too sometime? @Ping, @Michelle, @SewPetiteGal I'll try to put together that outfit again in the very near future. Thank you ladies for your interest <3! Im still scared of them! it might take longer for me to venture into that arena and by then I guess minimal look will be in and I'll feel at home :-D You look gorgeous! I agree about staying true to your style! you look so pretty! thanks for being part of the challenge, the outfit is perfect! @Tiffany Thank you for hosting the challenge. I had fun putting together the outfit.